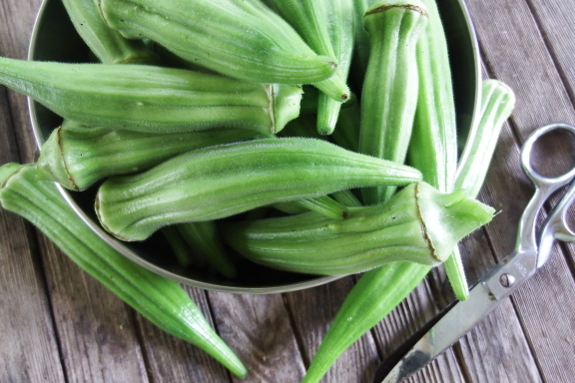 What do you do if you're harvesting two or three gallons of okra per week for a family of two? Freeze some for the winter, then try a new recipe to boost your current consumption, of course. My movie-star neighbor suggested a technique he calls blackened okra. He recommends starting with your biggest cast-iron skillet, but I instead opted for an even bigger stainless-steel skillet so we'd be sure to produce enough to serve three. I sliced the okra into rounds, placed them one layer deep on the oiled skillet, then cooked over medium-low heat for about an hour. I turned up the heat for the last fifteen minutes and stirred some, but didn't stir earlier since the goal is to drive off moisture (to prevent sliminess). Honestly, I think I could have cooked the okra a little longer/hotter, because it ended up browned instead of blackened. It was quite good, though, and half a gallon was quickly consumed by me, Joey, and Mark, with requests for more. Definitely a good start on using up all of that okra, but if you've got an even better recipe I'd love to hear it! Combine vinegar, water, salt, and seeds in a pot and bring to boil - let boil for 1 minute then turn off heat. 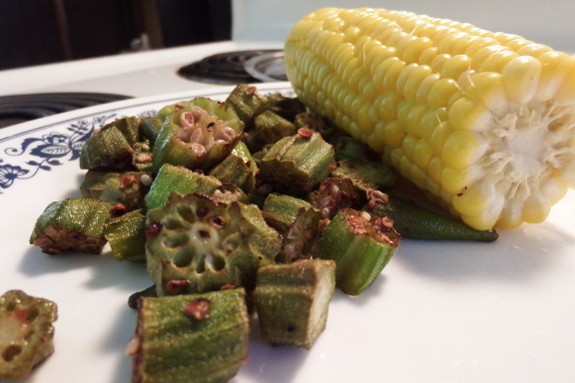 Add okra and jalapenos, let sit until it cools, stirring pods around occasionally. Put into jars (pints work well if the pods are small) along with liquid and seeds, and refrigerate for a week. If the jars aren't full when you're done, add more vinegar. I just tried baking them for the first time & the result was similar to what you described for your method. I slice them in half, leaving stems to make them good finger food for snacks. Tossed with small amount of olive oil, salt, & red pepper & baked at 350 for half an hour. Delicious! Crispy served out of the oven, and a nice chewiness for late. No slime! We cut the okra like you did and then roll it in corn meal and cook in a skillet with a little oil until brown and not slimy. Pink eye purple hull peas, creamed corn, corn bread and fried okra. Southern staple meal. And iced tea. I liked this recipe I saw on tv but only made it one. It is not a traditional fried okra recipe. The seeds tend to pop when it is cooking so keep a safe distance. Although I liked it, I never bothered to make it again. http://www.foodnetwork.com/recipes/sunny-anderson/fried-okra-recipe.html#! I rub a little oil on them and sprinkle cajun seasoning (or whatever). Skewer them whole, about 8 per stick, piercing across the top just after the stem end (not longwise). The skewer makes them easy to turn on the grill and prevents them from falling through the grate. We prefer smaller okra, about 2-3" long for this. We love them this way, never slimy. 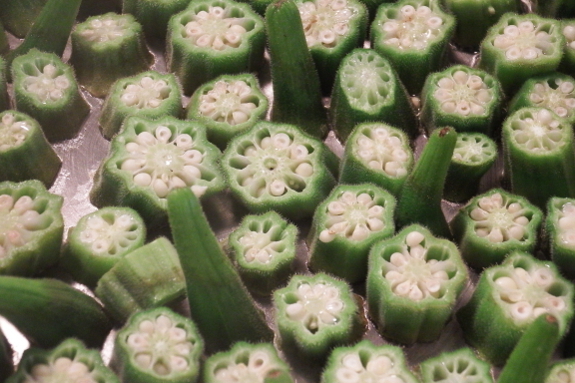 A Filipino friend says they eat okra nearly every day. Okra with pumpkin, coconut milk and prawns sounds delicious.